Be it gas, electric, or induction, ranges have held onto a vestigial limb—a finite, unmovable set of areas to do the actual cooking. This new induction cooktop from Thermador, however, is smart enough to heat anywhere there's a pot. 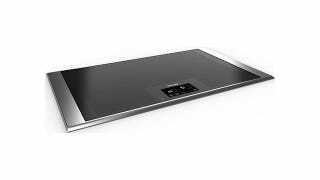 The new Freedom cooktop bills itself as the first induction appliance whose entire surface acts as a heating element. Its "natural-mapping" interface allows users to add, remove, and shift pans around while they cook and should allow chefs a greater degree of flexibility in their meal preparation. Induction cooking employs a copper wire running under the clear ceramic surface and a strong AC current to create a magnetic field which then transfers an electric current to the cookware. This heats the pot itself while keeping the range cool to the touch. It's more efficient than both gas and traditional electric methods.